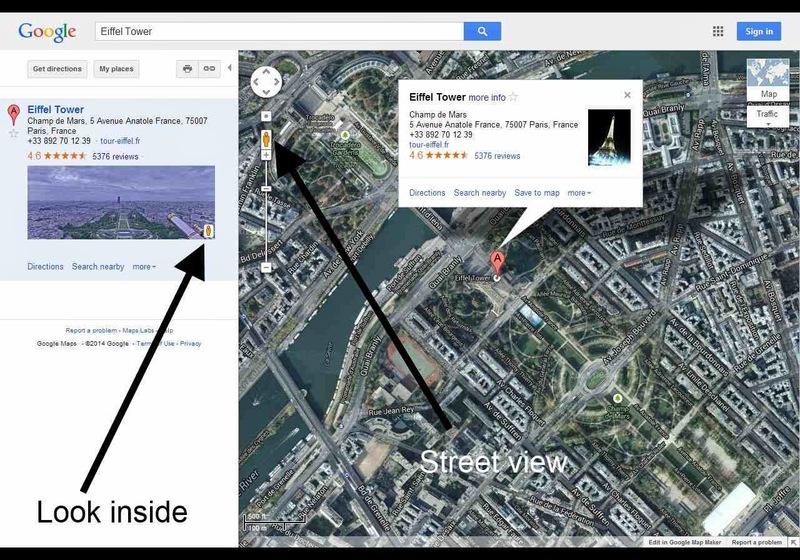 There are several useful google map types which can be good for your blog or site. These can range from the Find us simple map, to directions from A to B, or even street views, Photos and Look inside. The following are selections of the simple types of views you can put on your site by using the Google maps embed option and without resorting to the Google API. 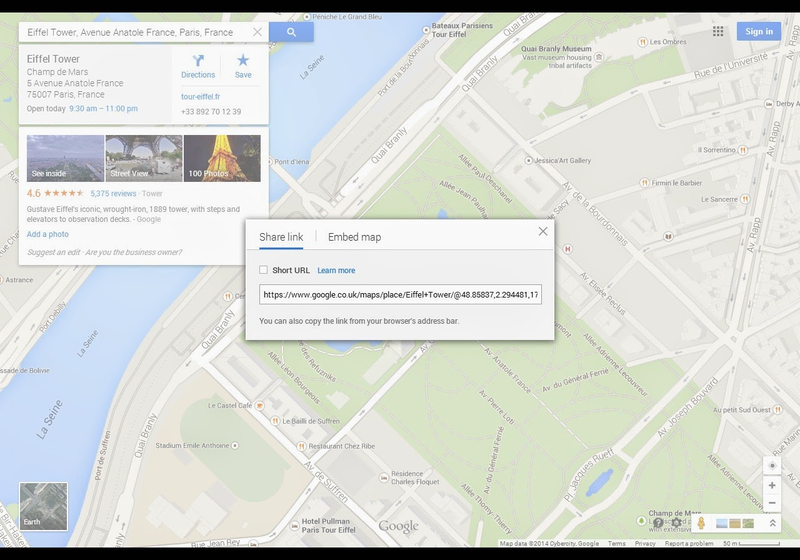 BUT note that to get all of these you need to swap between Google map versions as Google have not included some of the old embedding features that were available in the version pre March 2014 Classic version. Type Eiffel Tower in this box as below. You will see that the search box automatically comes up with some options, so click the first one. As below you will be presented with a map of the Eiffel tower and its vicinity. Once you have manipulated the map to how you desire, i.e. move in closer or further away, then click on the options icon and you will see a menu appear as below. This will bring up the Share and Embed dialogue and you need to click on the Embed map link at the top of this dialogue. We then need to go to the place in your site where you want the map to appear. If a new blog post then within the POST editor, click on the HTML button in the top left and paste the code directly in. 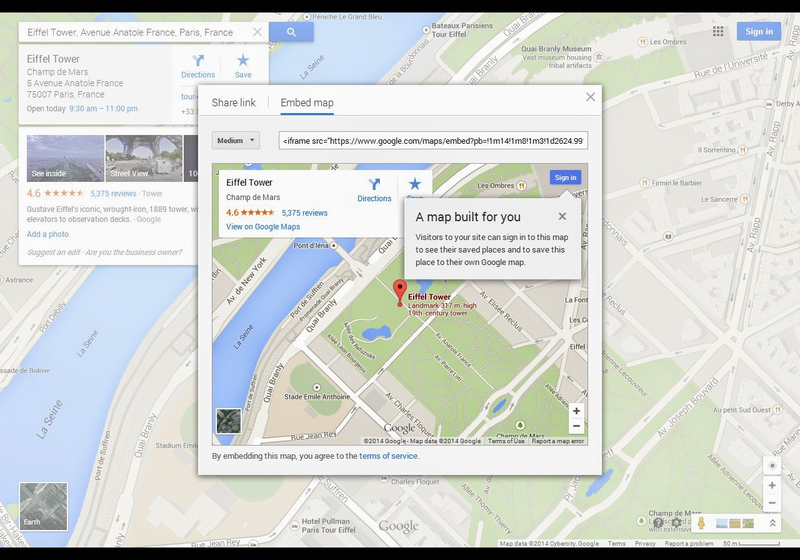 And if you revert to the Compose button or preview the post you will see the embedded Google map ! 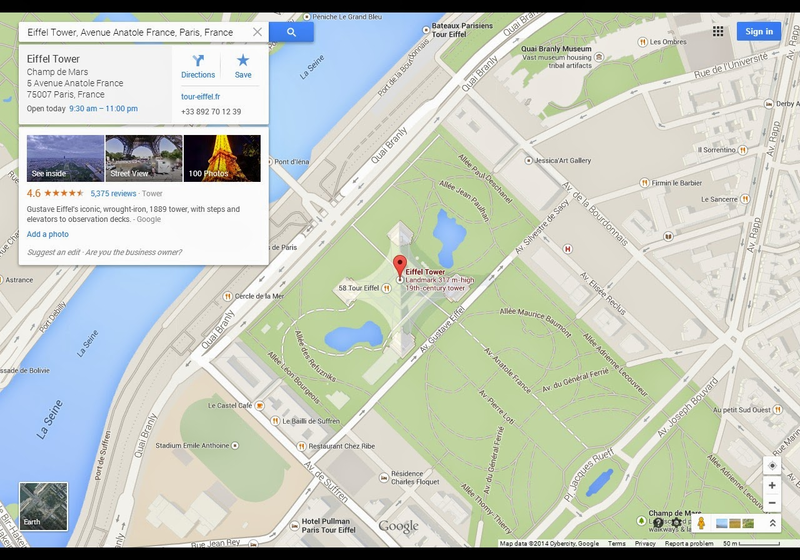 Note how these provide a low function Google map which you can use like Google maps from your site. 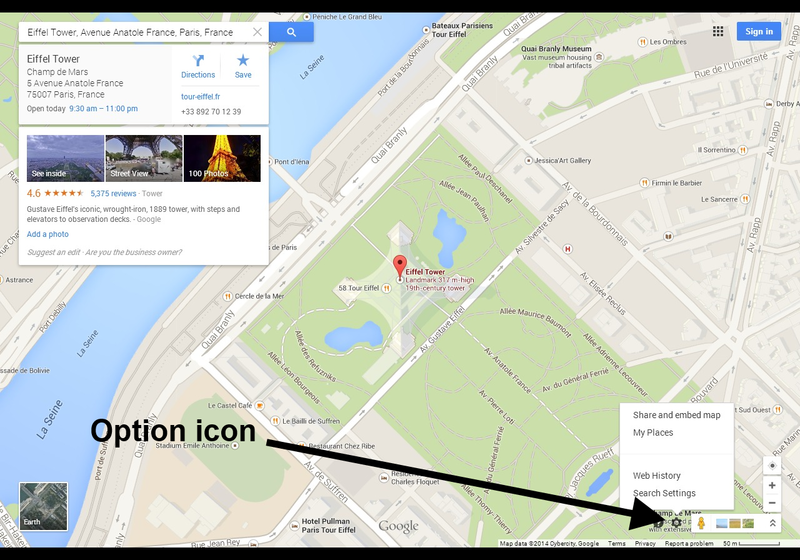 If you click on the map, then the description box will disappear and you will see a view on Google maps link which takes you to the fully functioning Google maps. 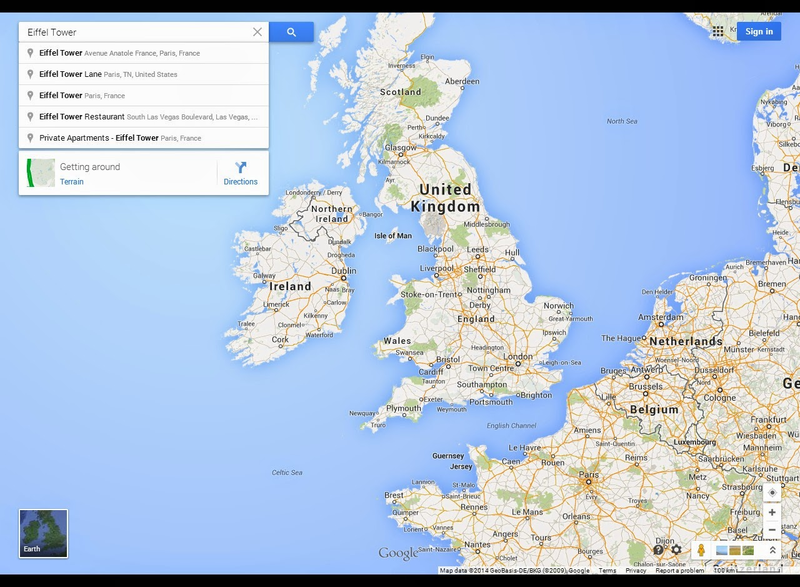 So to get other views in new Google maps click on the Earth box in the bottom left of screen as above. This will convert the map to a satellite view. Take the same steps as above by clicking the Options icon, clicking on Share and Embed map, clicking the Embed map link (it may by default be in this view), copy the iframe source code, and paste into an HTML page with result below. 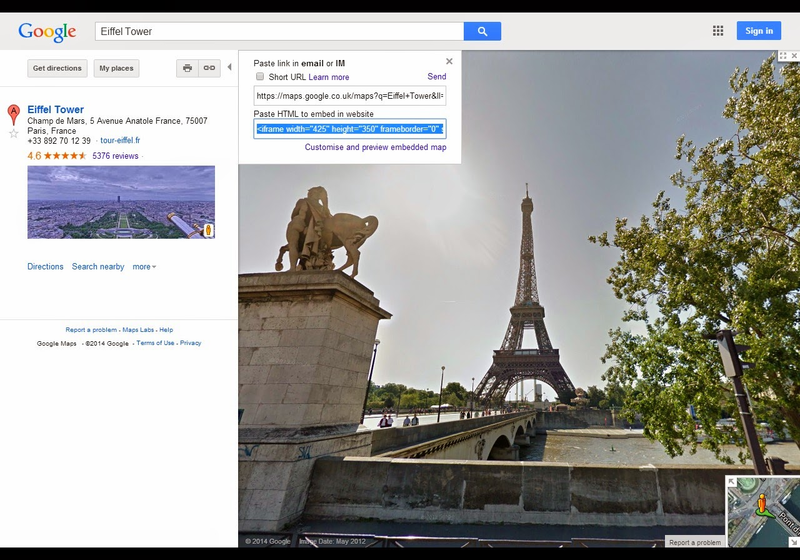 If you want directions to Eiffel tower then type in for example London to Eiffel tower to get the directions view. Use the Embed technique as above and insert into your site like below. 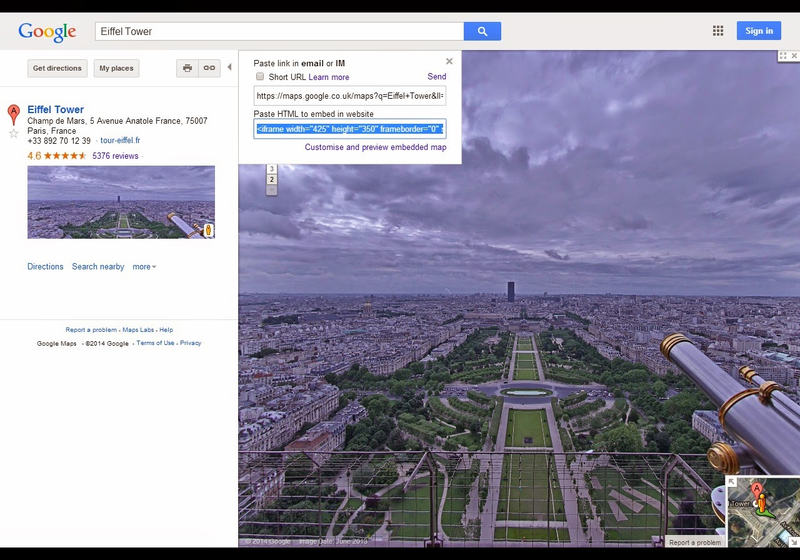 If you hover above the Eiffel tower description box at the top left then this should bring down pictures (like the found Eiffel tower screen shot above) of other Google map features such as See Inside , or Street view or Photos. If you click on one of these, the browser presents these options, but if you press the options icon to embed for all these options the embed is not (yet) available in new Google maps. Once you are back in Classic Google maps then you will see screen as below. Click on the highlighted street view icon (yellow human) and drag it to the street from which you want to view. In the top left you should be able to see 4 buttons, Get directions, My Places, Print and the handcuff like Link button. Click on the Link button. This will bring out the menu shown above to the right of it and as above copy the iframe code from the Paste HTML text box into your site giving embedded Google map below. You can change the size of these maps by modifying the width and height properties within the iframe code.